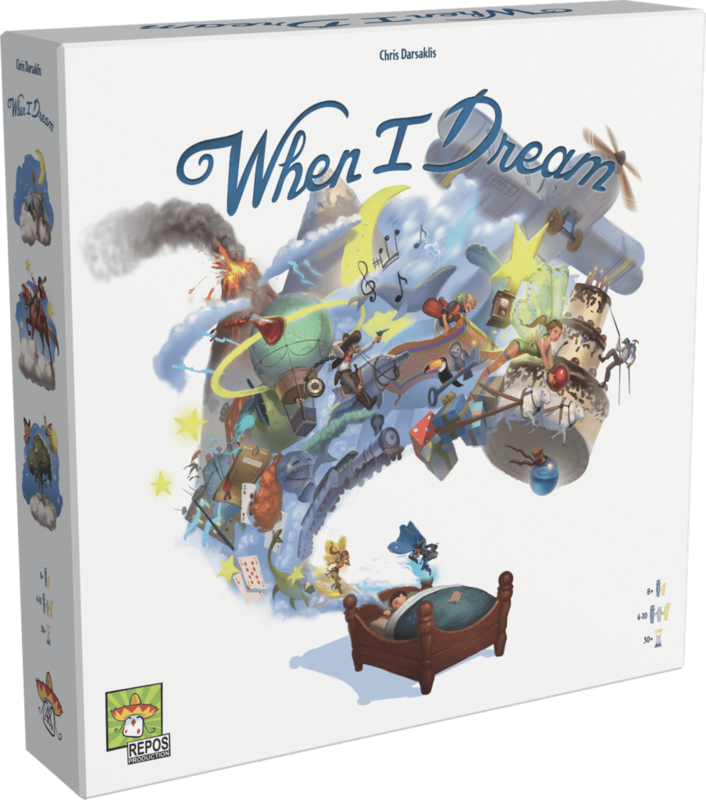 When I Dream is a Deduction game from Chris Darsaklis, published by REPOS Production. The players take on the forum of the Dream Spirits. Their goal is to give one player a night of dreams to remember. For better or worse. The main concept sounds simple. Players take it in turns to describe the image on a card, using one word only. But, not every player wants the dreamer to guess right! At the beginning of the night, each non-dreamer takes a spirit card. These give them a hidden role of either Fairy, Sandman, or Bogeyman! The Fairies are looking for the dreamer to guess right, while the Bogeymen are doing the opposite. The Sandman look to keep the sides in balance. How effective each spirit is at their role determines how well they score at the end of the night. The Dreamer also scores based on how many dreams they guessed. They can earn bonus points for recounting their entire dream. The game becomes more about Social Deduction. Not only is the Dreamer trying to guess the dreams, but guess which of the spirits are trying to tamper with them. It’s lot of fun trying to use a single word to describe what’s on the card. Yet, it can also cause a lot of panic freeze moments, especially when the Dreamer takes a bit longer to guess. When I Dream plays from 4 – 10 players. In a lower player game, Dream Spirits may need to think of several words before the Dreamer makes a guess. The longer this goes on, the harder it becomes to think of words. Players may call pass, and if the Dreamer passes then it counts as an incorrect guess. Of course there is a time limit to the dreams, that adds pressure to everyone trying to guess. The only problem is that in the box comes a sand timer. Everyone is so frantically looking at the cards and thinking of words, that no-one remembers to look at it! We found that we needed a phone timer with an alarm. But then, who doesn’t need an alarm to wake them up? One of the most unique things about When I Dream is the artwork. 20 different artists designed the 110 dreams cards. Each of which is double-sided. Despite this, the style remains consistent throughout. And that style is beautiful. There’s enough detail in each card to help the spirits describe what’s on it. Whether they are trying to help or hinder the player. • If a player gives an improper clue, the current Dream card is placed in front of that player as a penalty. It will reduce their score by one point at the end of the game. Proceed with the newly revealed card but make sure that the Dreamer knows that the Dream card has changed. As mentioned before, each card has two designs on it. We took the above rule to mean that even the Bogeymen had to allude to the word that was being guessed. After seeking clarification, it seems that so long as the Bogeymen are still describing some element of what is on the card, all is fine. Knowing this made the game a lot more balanced, and scores were very close at the end of the game.